Did This Lamborghini Sesto Elemento Break Down? 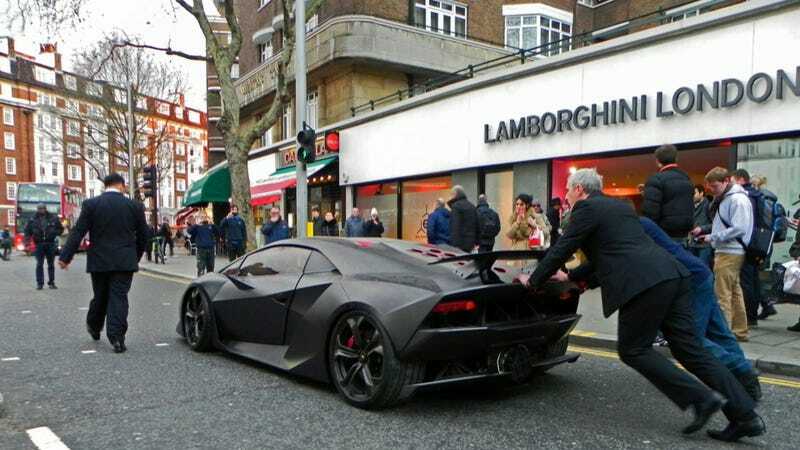 Here we see a man pushing Lamborghini's lightweight Sesto Elemento through London's streets. Looks like typical Lamborghini reliability, no? The guy is actually just pushing the concept car off a trailer. It looks to us like Lambo chose to hand-power the not-road-legal car the twenty feet from the truck to the dealership display. While we would have loved for Lambo to have done a few donuts, that wasn't going to happen. Hey, maybe we're wrong. Why do you think this Sesto Elemento is getting pushed down the street?